In April of this year when I wrote God’s Hand Is Mightier Than A Falling Tree I had no idea I would be writing about another one of God’s falling tree miracles so soon. It was close to midnight Friday night. My husband and I had just gone to bed. We heard a huge crash as if someone had jumped on our roof. The house shook. The dogs barked. Hubby immediately went outside to investigate and found nothing. 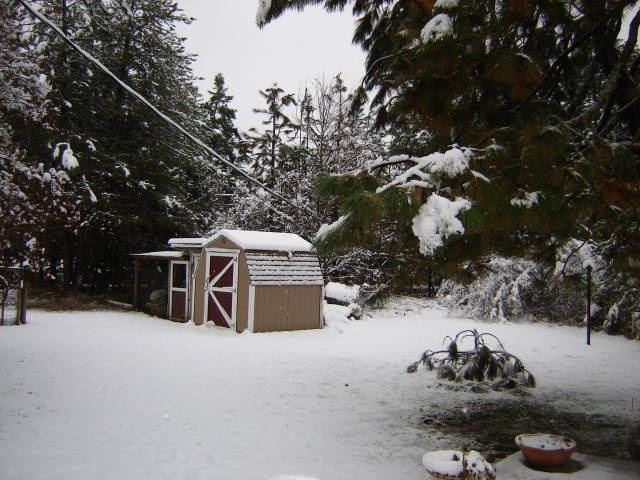 We live in the northwest and were in the midst of our first solid snow fall. Every single tree branch was heavy laden with snow, almost touching the ground. These trees normally have a clearance of about seven feet. Hubby came back in the house not having any clue what the sound was. We figured it may have been a lump of hardened snow falling from one of the roofs onto the other, but that seemed unlikely since the snow was soft. We were baffled by the mystery. I was hoping it wasn’t a structure problem with the house. “Wow, it was strange, I could hear a cracking sound, like trees cracking out there,” he said when he came back in. Hmmm, I thought, that’s pretty odd. About 10 minutes later we heard a giant crash sound coming from our front yard. He grabbed the flashlight again and went outside to the front yard to investigate. “Hey, you have to come here to see this!” he said. A tree by our driveway cracked near the bottom of its trunk and fell, hitting the only tree in its path, near the house. The fallen tree hit the lone tree trunk, then snapped back in two pieces. The broken half, the top half of the tree fell backwards, the exact opposite way which it had fallen. 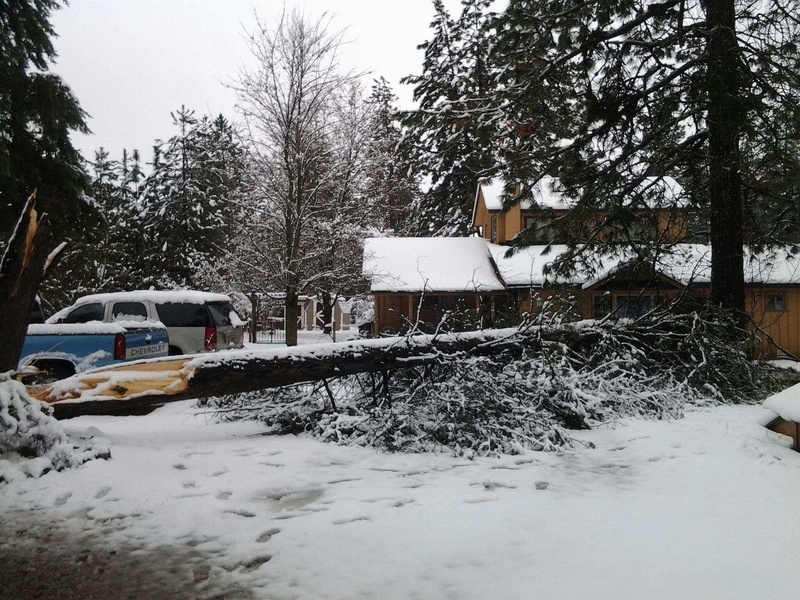 In the pictures you can see the broken tree trunk at the end of the driveway. If you follow the trunk with the snow on it (it looks like a straight horizontal line in the 2nd picture) you can see where it then hit the lone tree’s trunk, snapped in half and and the broken half folded back the other way missing our cars, thank goodness, but leaving our cars trapped in the driveway. In the picture with the wooden post in it, I was standing under my porch. The tree missed the light post, it missed the cars, it missed the house and the porch, and it missed a well house you cannot see on the other side of the fallen tree. You can see the corner of the well house on the right. The other half of the tree landed just a few feet from the cars! This is taken from the front porch. The lamp post was just missed, so were the roses and the rest of the house. Coincidence? I think not. As much of a coincidence as there being an explosion in my kitchen cabinets and out popping a ten course meal complete with a scrumptious desert. I believe God in His mercy directed that tree to fall exactly where it fell to protect the house, the cars, the lamp post, the well house, and our sanity. “Wow, that’s the cracking noise you heard when you were outside?” I told my husband referring to the fallen tree. “Good thing it didn’t fall when you were walking around outside!” We were both quiet, contemplating the whole thing. There was still the mystery of the first crash. Hubby started looking closer around the house and found that a branch from another tree, one in the back yard this time, had broken off and fallen on the electrical line attached to our house, nearly dragging the line down. I prayed while hubby dislodged the broken branch from the electrical line. You can see the line sagging across the yard six feet off the ground. We discovered the original crash we heard happened when the branch fell and hit the line, stretching the line and breaking the masthead attaching the cable to the roof. The cable stayed connected, still providing us with electricity, but it would be a matter of time before the pressure completely disconnected the cable leaving a live wire on the ground. Electrical cord hangs six feet from the ground in back yard after hubby removed broken branch. You can see the large broken branch on the ground. For us this time, when it snows, it breaks. By morning a good portion of the snow melted, making a sloshy mess to walk on. Hubby called the power company and left a message about the cable. Things finally settled down and we went to bed. Shortly after about 1:30 in the morning, the power went out all over the neighborhood, and stayed out for over twelve hours. We heard another power line was knocked down; this time it lay on the highway, live. The highway was closed immediately. Today, it took a crew of three, plus with my husband helping off and on, about four and a half hours to clear the mess from the driveway. The power company pulled the cable to a safe height. Goodness, we only had a foot of snow! It has been one of those kind of weekends! MIRACLES STILL HAPPEN! OUR GOD IS AN AWESOME GOD! Never underestimate the power of Almighty God’s protection. Whew, so glad God protected you guys! ❤ We used to live in southern British Columbia and know the snow there is super heavy with moisture! Yep, very heavy when it is wet! He sure was looking out for us! Isn’t he amazing! Yes, indeed God moved His mighty hand and protected you, your hubby and your home. 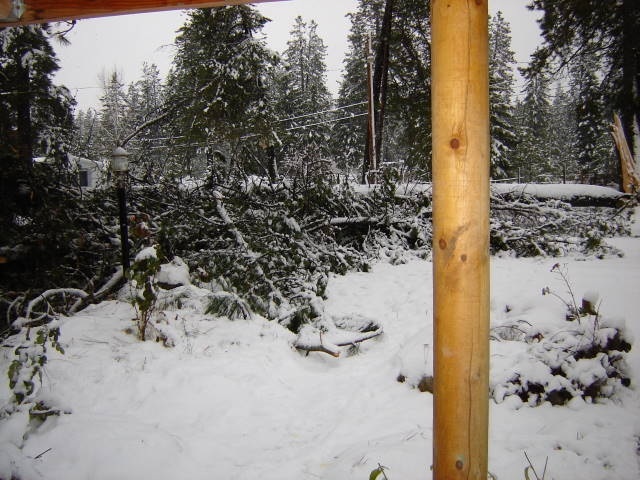 Years ago we lived in the Pacific Northwest, and after seeing all the damage those huge trees can cause several times, I was thankful that we purchased a house with no big old Douglas Firs around it. So glad you were spared. Thanks! He sure did spare us! 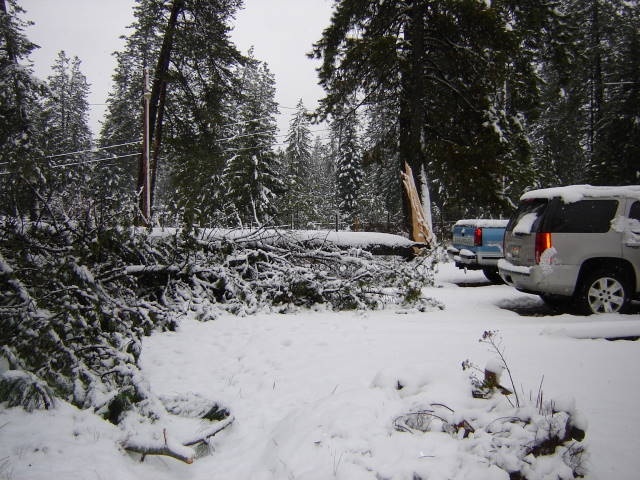 I live in the Pacific Northwest and yes, those huge trees do cause a lot of havoc, especially during the winter. It was hard to believe for us also! God is so good!